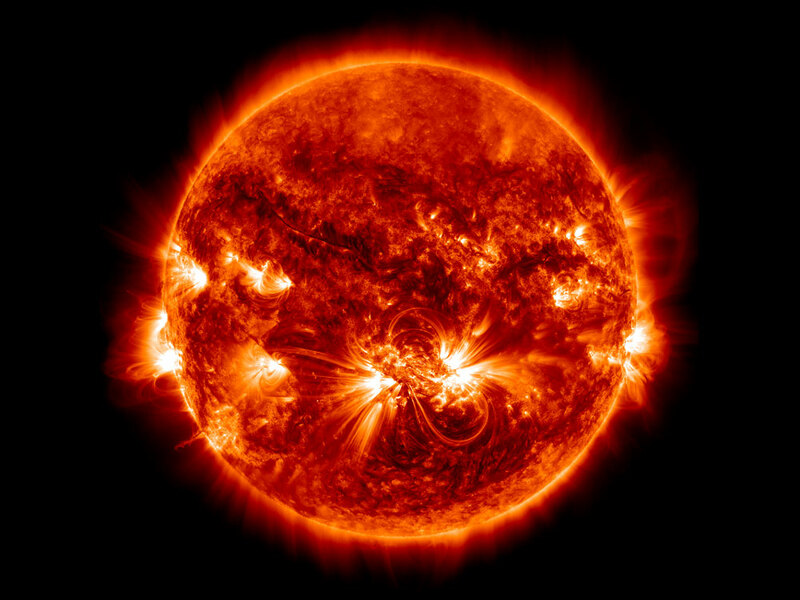 The elemental composition of the Sun's hot atmosphere known as the 'corona' is strongly linked to the 11-year solar magnetic activity cycle, a team of scientists from UCL, George Mason University and Naval Research Laboratory has revealed for the first time. The study, published in Nature Communications and funded by the NASA Hinode program, shows that an increase in magnetic activity goes hand in hand with an increase of certain elements, such as Iron, in the solar corona. It is thought that the results could have significant implications for understanding the process leading to the heating of the Sun's corona. "Elemental composition is an important component of the flow of mass and energy into the atmospheres of the Sun and other stars. How that composition changes, if it does indeed change, as material flows from the surface of the Sun to its corona influences ideas we have about the heating and activity in atmospheres of other stars," said Dr Deborah Baker (UCL Space & Climate Physics). Through its 11-year cycle, the Sun moves from relatively quiet periods at solar minimum, to intense magnetic activity at solar maximum, when large numbers of sunspots appear and there is an increase in radiation. "Previously, many astronomers thought that elemental composition in a star's atmosphere depended on the properties of the star that don't change, such as the rotation rate or surface gravity. Our results suggest that it may also be linked with the magnetic activity and heating processes in the atmosphere itself, and they change with time, at least in the Sun," said the study's lead author, Dr David H. Brooks (George Mason University). The Sun's surface, the photosphere, has a temperature of around 6000 degrees, but the outer atmosphere, the corona - best seen from Earth during total solar eclipses - is several hundred times hotter. How the corona is heated to millions of degrees is one of the most significant unsolved problems in astrophysics. The solution will help scientists better understand the heating of other stars. "Why the Sun's corona is so hot is a long-standing puzzle. It's as if a flame were coming out of an ice cube. It doesn't make any sense! Solar astronomers think that the key lies in the magnetic field, but there are still arguments about the details," added Dr Brooks. The team of scientists analysed observations from the Solar Dynamics Observatory at a time of low activity (solar minimum) starting in 2010, and through till 2014 when huge magnetic active regions crossing the solar disk were common. An unknown mechanism preferentially transports certain elements, such as Iron, into the corona instead of others, giving the corona its own distinctive elemental signature. The team think that the mechanism that separates the elements and supplies material to the corona may also be closely related to the transport of energy, and that understanding it may provide clues to explain the whole coronal heating process. "Our observations started in 2010, near the last solar minimum, and so observations of the global coronal spectrum for a complete solar cycle have not been possible. The fact that we detected this variation of the Sun in a relatively small period of time really highlights the importance of observing stars over complete stellar cycles, which we hope to do in the future. Currently we tend to just have snapshots of stars, but these are potentially missing some important clues," said Dr Baker. Whilst it would require long-term planning, the scientists expect that observing full stellar cycles would provide new insight into the nature of the atmospheres of stars and how they are heated to million degree temperatures.